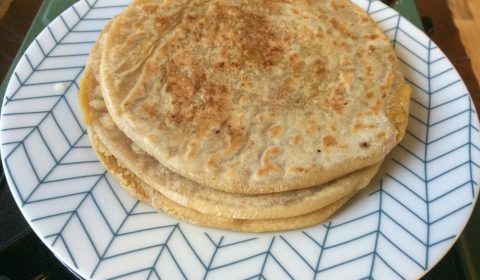 Puran poli/VedmiPuran Poli /Vedmi is an Indian flatbread stuffed with sweet lentil filling. 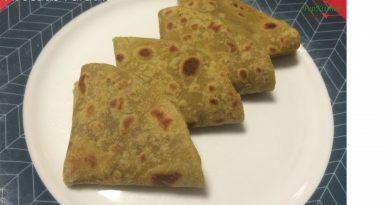 It is known as Puran Poli in Maharashtra and Vedmi in Gujarat. It is relished during festivals such as Diwali, Gudi Padwa, Navratri or Holi. 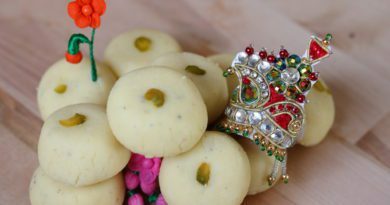 I have made this sweet delicacy for the festival of Gudi Padwa. My mother is Maharashtrian and so I had grown up enjoying many Maharashtrian delicacies prepared by her such as modak, shrikhand, aam paana, pithla bhakar, masale bhaath, tomato saar, chakli, thalipeeth, vangi bhaat, usal, puran poli and many more. Puran Poli is my favorite and it refreshes my childhood memories of having it on Gudi Padwa. No celebration or festival in Maharashtra is complete without the traditional puran poli. Gudi Padva is the New year for Maharashtrians. It is a springtime festival and is celebrated on the first day of the Chaitra month to mark the beginning of the New year as per Hindu calendar. “Padva” refers to the first day of the Lunar fortnight. People celebrate this festival by making designs with different colors known as “rangoli ” in front of their houses. Gudi- a kind of flag made with flowers, mango, and neem leaves, topped with upturned silver or copper vessel is erected in front of the houses for the entire day. As per Wikipedia, Gudi is a bright colorful silk scarf-like cloth tied at the top of a long bamboo. On top of it, one or more boughs of neem leaves and mango leaves are attached along with a garland of flowers. This arrangement is capped with a silver, bronze or copper pot (handi or kalash) signifying victory or achievement. The whole arrangement is hoisted outside each household, typically to the right, or through a window or terrace. It is visible to everybody. Villages or neighborhoods also come together and host a community Gudhi Kavad, which they carry together to the local Shiva temple. Some temples are located on the top of hills, and groups work together to help reach the kavad to the top. This is a very auspicious day and people purchase gold, property, vehicles or start their new venture on this day. On this day at a bitter chutney or juice made from fresh neem leaves is servealong with the sweet puran poli. The fresh leaves from neem leaves are best to have in the month of chaitra. It has many medicinal and antiseptic values. 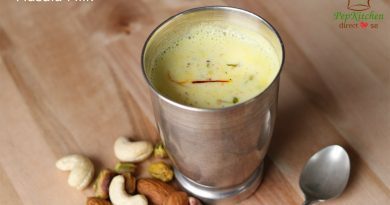 At our place we have the neem juice on empty stomach in morning for the first fifteen-day of Chaitra month. 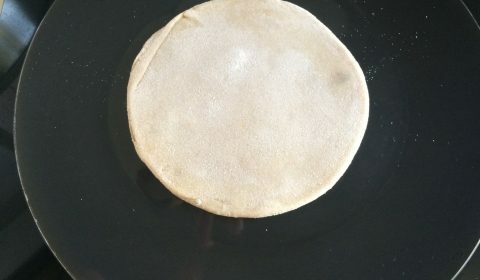 Puran poli is known as vedmi in Gujarat, Holige in karnataka, oligalu in tamil nadu. Puran means stuffing and poli means roti in Maharashtra. 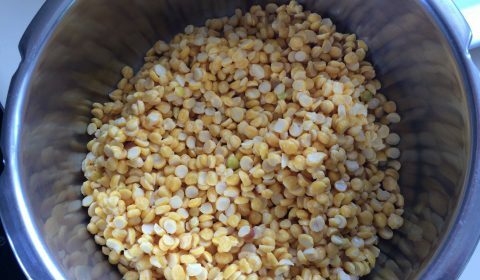 The stuffing is prepared in many houses either with chana dal (split bengal gram) or tuvar dal (split pigeon pea). 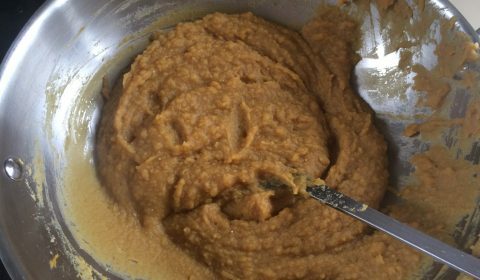 For sweetness either jaggery or sugar is used. 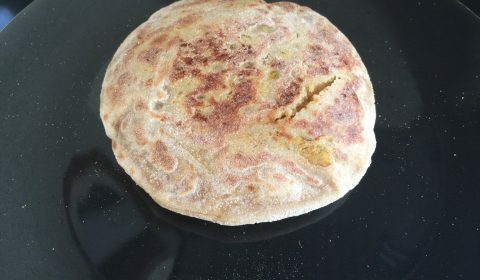 The outer roti is made of maida or whole wheat flour. Some people prefer making a big and thin puran poli and others prefer to make it small and thick. 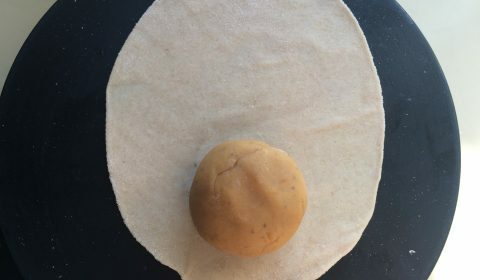 Some people make puran poli by placing the stuffing between two layer of roti and then rolling it thin. 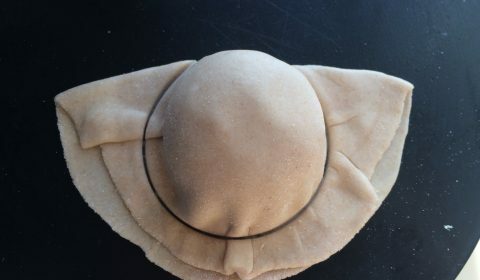 Some prefer placing the stuffing in a single roti and covering the edges and then rolling it thin or thick as I have shown below. At my husband’s place, we call puran poli as vedmi and is served with gujarati kadhi. You will find it served in Gujarati thali in the restaurants. 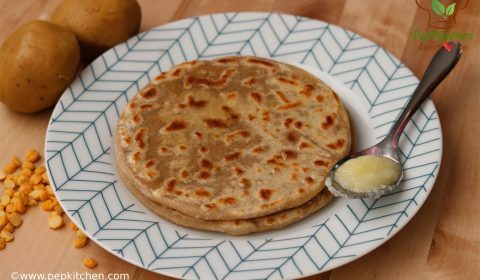 Whatever be the name and style of making, It is heavenly to have puran poli hot with a dollop of ghee floating over it. It is good to pack for kids lunch boxes. It is also a good source of protein and is good for growing kids. 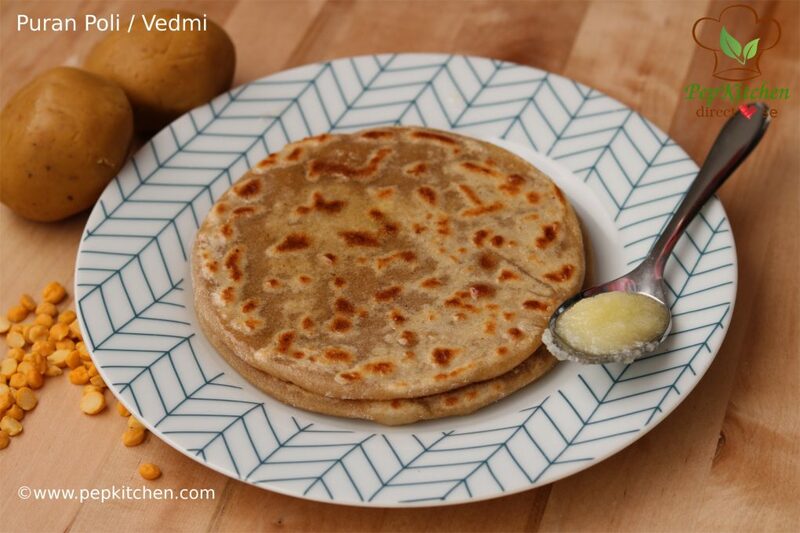 Puran Poli /Vedmi is an Indian flatbread stuffed with sweet lentil filling. 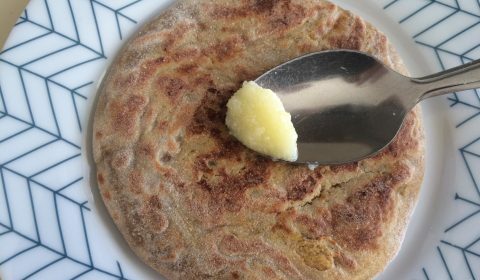 It is known as Puran Poli in Maharashtra and Vedmi in Gujarat. It is relished during the festival such as Diwali, Gudi Padwa, Navratri or Holi. 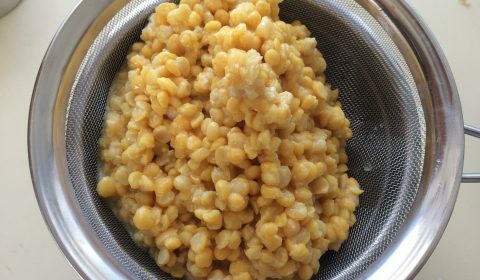 Wash and soak the chana dal for 3o minutes. 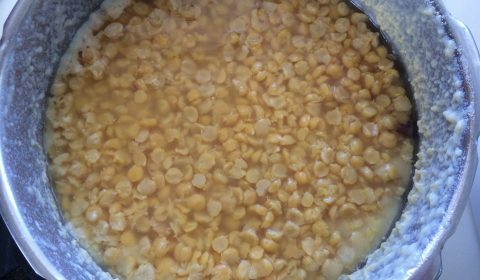 Drain the soaked chana dal and put it in a pressure cooker pan. Add 3 cups of water to it. Pressure cook for 6-7 whistles on high heat and 2 whistles on low heat. Meanwhile, knead the dough. 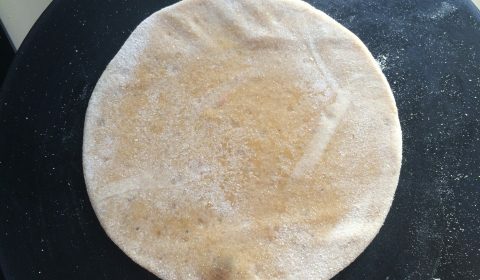 Take whole wheat flour in the flat dish. Add 1 tsp oil and mix well. 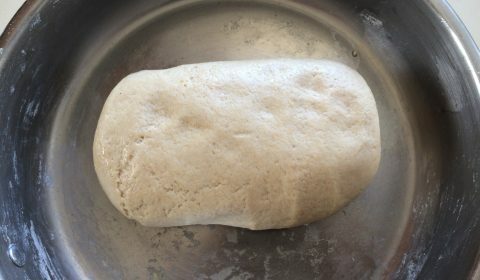 Start kneading into a smooth dough by adding water. 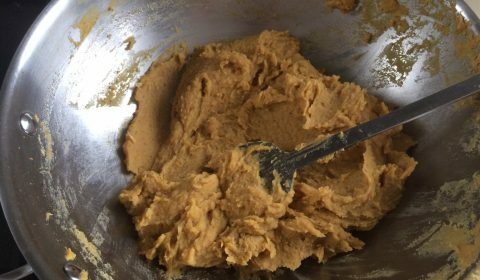 Smoothen dough by applying left 1/2 tsp oil on it. 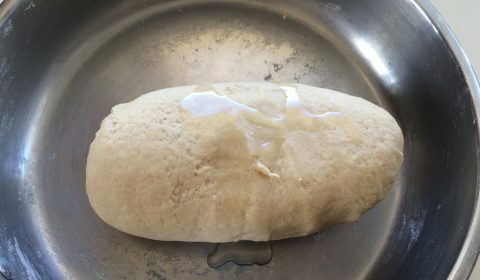 The smooth dough is ready. Cover and let it rest. Let the pressure cooker cool by itself. Remove the lid. The chana dal is cooked. Drain the cooked chana dal. The drained water can be used to prepare a sweet and sour spicy dal to be served with puran poli. 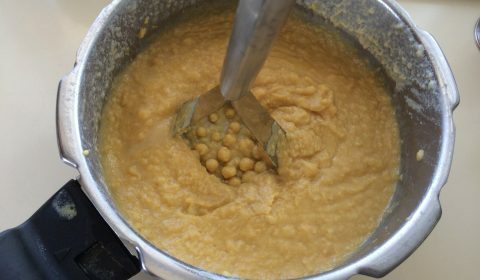 Mash the cooked and drained chana dal with a potato masher. 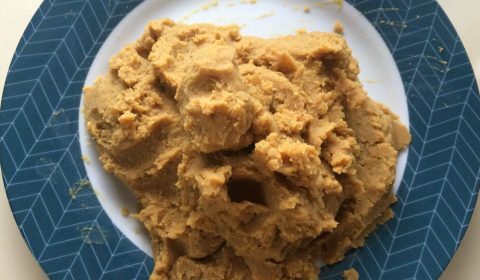 It should be mashed till smooth. (You can also blend with a hand blender or kitchen master). 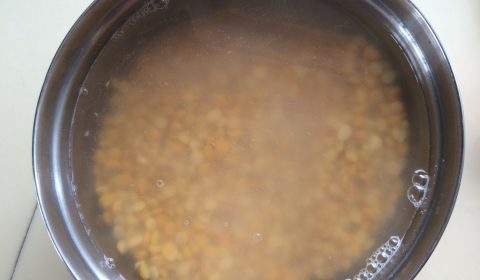 In a broad thick pan add the mashed chana dal and grated jaggery. Start heating on high heat. 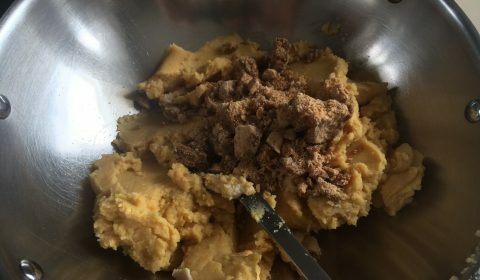 The jaggery will melt and the mixture will become of thin consistency. 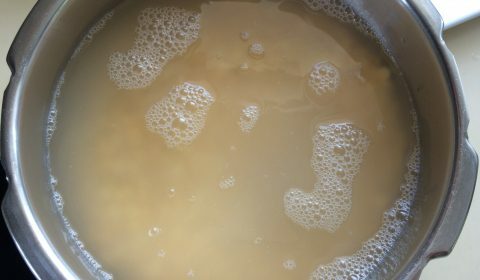 Stir the mixture continuously at medium to high heat until the liquid is absorbed and mixture thickens. To check whether the stuffing is ready, insert the spatula vertically in the center of the stuffing. If it stands straight the mixture is thickened and is ready. If it falls then cook for further 5-6 minutes. 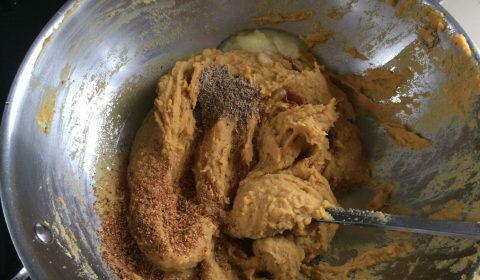 Add ghee, cardamom powder, nutmeg powder and saffron strands. Mix well and cook for 2-3 minutes till the flavors of spices are absorbed. 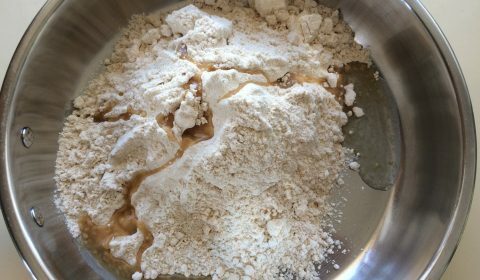 Remove the mixture in a plate and let it cool. 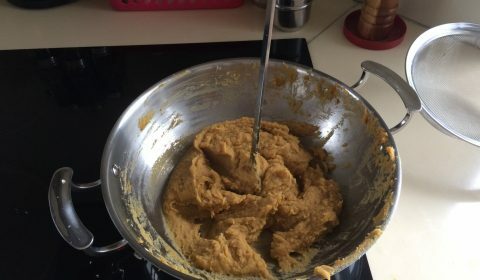 After the mixture is cool, smoothen it with hands and make balls from it. The balls should be smooth. 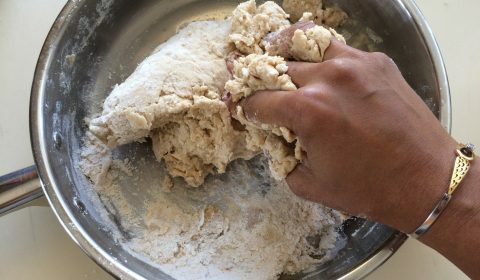 Take a ball from the kneaded dough. 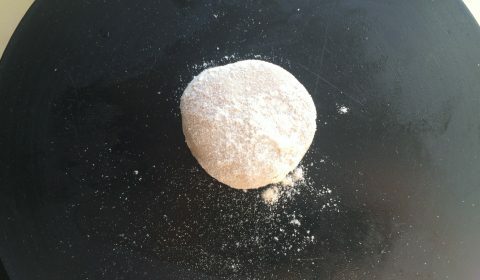 Flatten it and dust with flour. Roll it into big oval shape as shown. 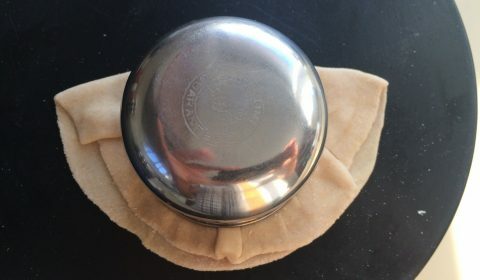 Place the prepared stuffing(puran) ball. Flatten the ball. 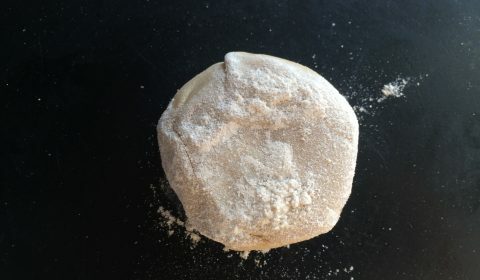 Press the edges of the stuffed ball and flatten and dust with flour. Roll into a 4mm thick circle of 10 cm. Heat the flat pan. Put the prepared stuffed circle on it. Cook till the bubbles appear. Gently flip to another side. Cook by flipping on both the sides till golden spot appear. 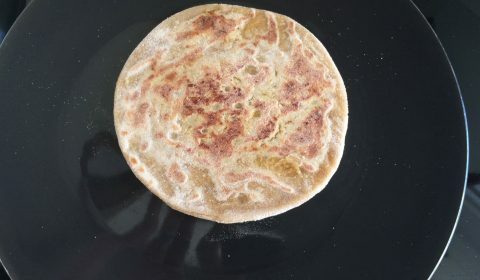 The puran poli will puff up. It is ready. Remove it to a plate and apply ghee over it. Similarly, make the other puran poli or vedmi. The puran poli or vedmi is ready. Serve it with some extra ghee with kadhi or batata sukhi bhaji. looking so delicious. Puran poli is loved by all in our family.